Retail $16.95 SAVE 16% ! This book has everything beginning modellers need to know to get started in this hobby and, it encourages them to become intermediate to advanced enthusiasts by introdicing them to the more advanced forms of kitbashing and scratchbuilding. 88 pages full of photos and good advice.. Tips for tools, adhesives, scratchbuilding, kitbashing, conversions detailing, airbrushing, decals, weathering, and more.. 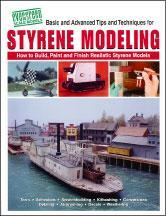 Explains how to build, paint, and finish realistic styrene models models..
One Basic and Advanced Tips and Techniques for Syrene Modeling Book.